One of the world’s most well-known personal audio companies has finally made forays into the hearing health world. For a long time, Bose has been helping us hear every frequency of our favorite songs. Now, they are doing the same for our conversations with the Bose Hearphones. Bose Hearphones help you understand conversation when you are out in louder places. These are the very first headphones designed to improve hearing in environments where you might need a little more help. Have you ever been in a café and found it hard to hear the end of your friend’s anecdote? Or been the last to understand a joke at a dinner party? These headphones could give you the edge in these situations. They come with the classic Active Noise Reduction featured in many of Bose’s previous products, as well as customizable microphones and sound, wireless technology, a secure fit and access to the Bose Hear app. Although Bose Hearphones are not a hearing aid (they are classified as a 'Personal Sound Amplification Product’), they are designed to assist those wearers who may not yet need a hearing aid, but who have some difficulty hearing in noisy places. In addition to this primary function of aiding with public conversations, they can also provide a clearer, more enjoyable listening experience when it comes to live music, television, radio, and incoming phone calls. For years, you could buy the best headphones in the world, but you would still lack the ability to control intrusive noise in your immediate environment. Bose changed that with the introduction of Acoustic Noise Reduction. Already a standout feature in their award-winning QuietControl 30 wireless headphones, Bose Hearphones contain Acoustic Noise Cancelling technology. This feature uses internal microphones to pick up and record external noises. The technology then instantly creates an equal but opposite frequency signal in response to the noise, which serves to counteract the ambient noise. The noise cancellation is enhanced by the use of earbuds that gently block the ear canal from the outside world. With Acoustic Noise Reduction you immediately feel less overwhelmed by the barrage of sounds around you. The noisy world suddenly doesn’t seem so stressful. Bose Hearphones also come with microphones which can be configured to point towards the conversations you actually want to hear. You can do this through the Bose Hear app or by using the side buttons on the remote control. Are you facing a friend for lunch in a busy restaurant? Focus the sounds in front, and the microphones switch to pick up everything in front of you, while simultaneously quietening all the ambient noise--like the endless clatter of dishes coming from the kitchen. Those in other environments can also switch to various built-in settings inducing ones specifically for group conversation, watching television and listening to music. For those who need more customization, the Bose Hearphones are fully compatible with the Bose Hear app. Here you can really fine tune your settings to your own personal needs. 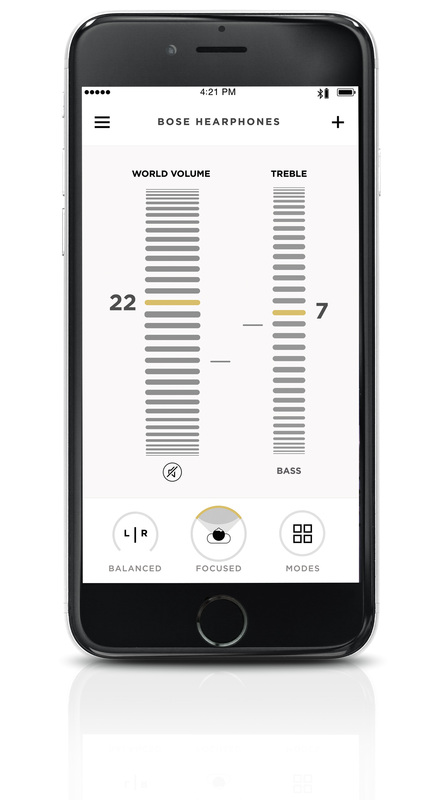 Handy bass and treble boosters help you make whatever you are listening to brighter or deeper. There are also settings to optimize music and calls. With a special feature called Ear Balance, you can even adjust the volume individually on each earphone to suit your needs. The Bose Hearphones are equipped with Bluetooth, which makes it very easy for you to connect to your other devices quickly and easily. You are also able to control your calls, tracks and volume without having to reach for your device. Finally, the multi-function button allows you to use voice commands like Siri or Google Assistant to play tracks and call friends. According to the Wirecutter website earphone expert, one of the most enduring mistakes people make when wearing earphones is not wearing the right fitting earbuds. This can affect bass response as well as your everyday comfort when wearing the devices. That’s why Bose Hearphones come with StayHear+ tips, which come in three sizes to suit all ear sizes. Offering a secure and comfortable fit, they are meant to form a gentle seal to maximize noise isolation. 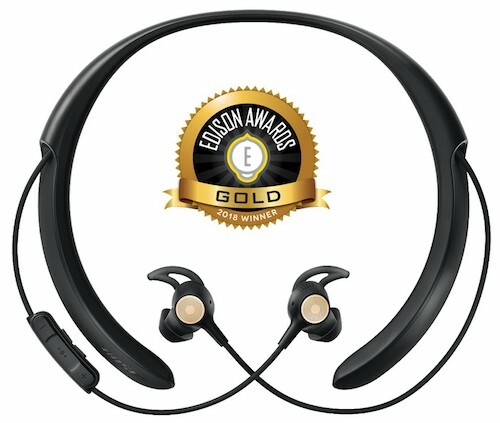 Finally, let’s not forget that Bose Hearphones let you listen to music with the same great sound quality that has given the company its stellar reputation over the years. You can expect premium sound in a package that also delivers 10 hours of battery life from a single charge. For those who need to take the edge off the noise and add a little boost to their conversations, the Bose Hearphones are the perfect companion.